Some fellow club members and I headed out to Grieser Field to enjoy and evening of deep sky observing. It was new moon, and the weather forecast was calling for clear skies. Jim and I got there first, braving rush hour traffic. Both of us almost got in accidents! Thankfully that did not happen. We arrived well before sunset and set up our telescopes, enjoyed Subway subs, and discussed the evening observing plans. The sky was still soupy from stubborn high Cirrostratus clouds and contrails and were were both worried that they would not clear off. Tim showed up just before sunset. Jim brought his 12″ Teeter. 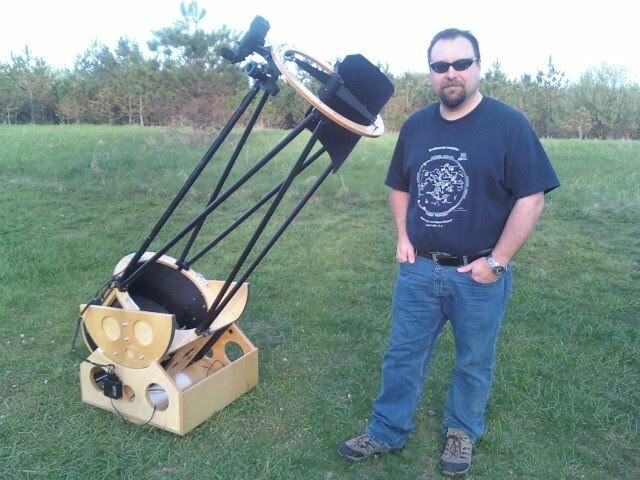 I brought “Electa”, my 16″ truss dobsonian I just finished. Tim brought a 10″ Orion Dobsonian. Tim just purchased a 15″ Obsession and Jim and I were giving him a piece of our minds for not bringing it!! We want to look through that thing! Tim has some tweaks to finish on it prior to using it, but he assured us next time, it will be available. As twilight settled in, we caught brief glimpses of Mercury dodging in and out of the clouds. Venus burned brightly and steadily. The brighter stars started to peak through the soupy muck above us. My heart started to sink. May as well sit back and relax for a bit and hope the sky gets better. Night arrived and the clouds really started to dissipate away. After some final tweaks to collimation, I started picking off some random objects including M35, M37, M47, M46, The Eskimo Nebula, and more. I brought my sketching materials to rekindle my fondness for sketching deep space objects. 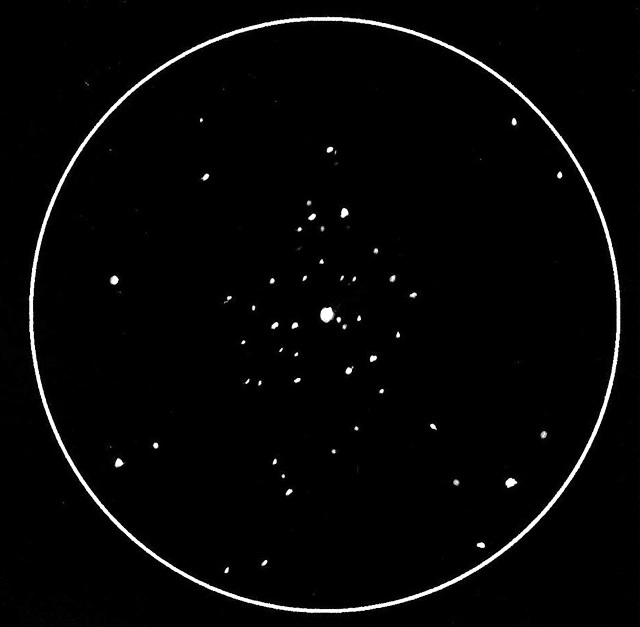 I have always wanted to sketch NGC2362, a beautiful open cluster off the tail of Canis Major. 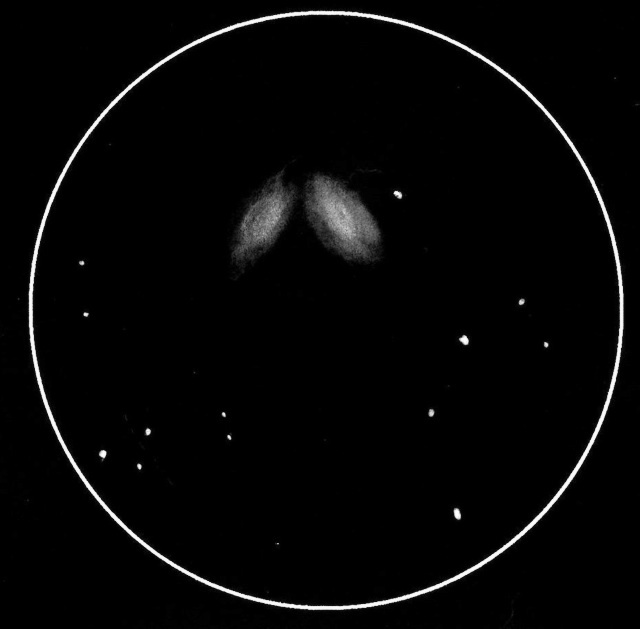 Mark Watson, a long time club member, bequeathed the title of “The Porch Light” because it appears like a group of moths are flying around a porch light. Initially, I started sketching using my 13mm Nagler, but I find I don’t do well with a large field of view. So I plopped my 12.5mm Orthoscopic eyepiece in. Ahh, much better. Once I finished NGC2362, I looked up and noticed the sky was getting really clear! 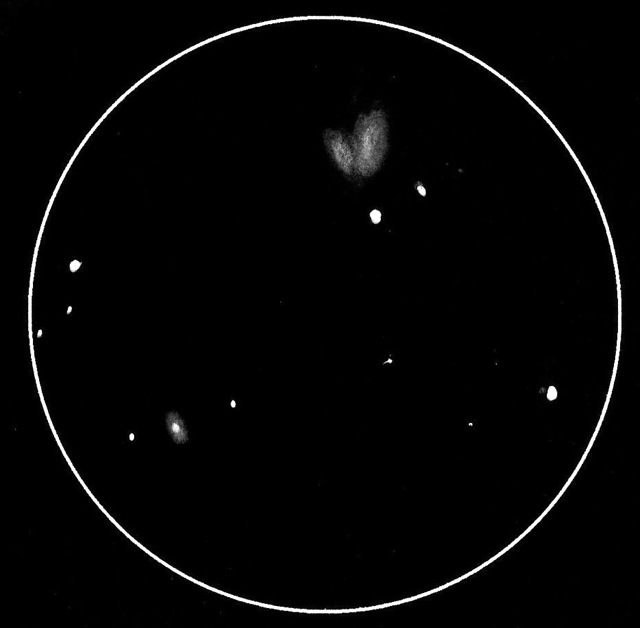 I glided the telescope up off the handle of the Big Dipper to have a glimpse of M51. The arms are clearly visible! I stopped by some other familiar targets, NGC4565, M64, M63, and more. I wanted to continue to sketch some more objects so I decided to hop over to NGC4762 and 4754, a nice pair of galaxies off of Vindemiatrix in northern Virgo. Ron Ravneberg really enjoyed this pair and I was introduced to them by Jim not too long ago. They are quickly becoming a favorite pair or mine too. While I was sketching, Jim was calling out cool objects he was looking at. Tim was amazed at M51 in his telescope. 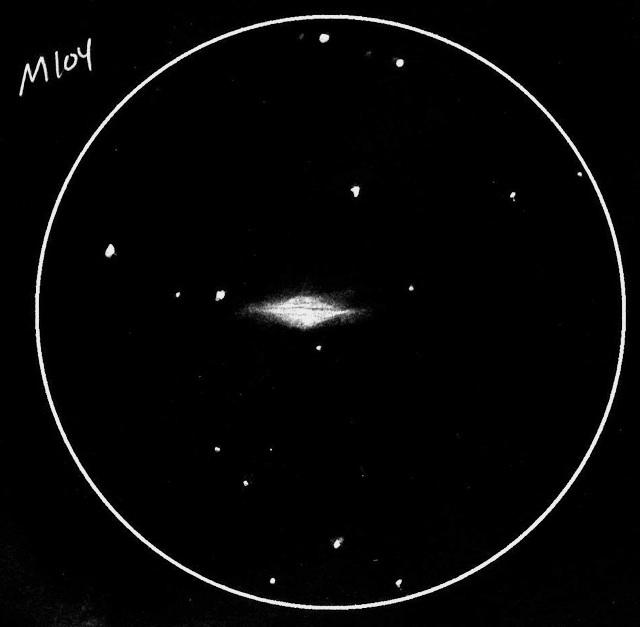 Once I finished sketching, Jim gave Tim and I the grand tour of the Virgo Cluster. We would all start at the “Smile” in Virgo, and Jim would then guide us both throughout the cluster. It was a good time. We probably spent half and hour going through everything! It was a hoot. I would use my green laser that is attached to my scope to make sure I was in the right place as Tim and Jim could see the laser in their finders and eyepieces. The temperature was not too bad and stayed into the 50s for part of the night. Then it quickly started getting colder as the night got clearer. I noticed a tick crawling on my hand. Jim and I took a walk earlier and we pulled off about 12 ticks from our pants. They were hungry! I was picking off “phantom ticks” throughout the night. My mind was playing tricks on me! I spent most of the middle part of the night going through my observing run. Picking off galaxies in southern Virgo, working my way up towards Spica. I had some detailed charts of 3C273 so I went off and searched for some ancient light. I quickly found it, and shared the view with my observing partners. The light from 3C273 left there around 2.6 billion years ago. Back when the earth was mostly covered in primitive algae generating Oxygen in the primordial atmosphere. Amazing!! The highpoint of the night for me is when I got to look at the Coma Cluster. We were seeing a lot more galaxies than I have ever seen. We counted 10 galaxies I believe! In the past, I could only detect about 3 or 4. This was turning out to be a good night!! I continued looking for more galaxies. Jim gave me a chart to search for comet in eastern Virgo. And from there, I did some more galaxy hopping. I got to see Hickson 67 which is a nice compact group of galaxies. I think I may want to start hunting these galaxy groups down. It was not that bright, so I still need some tweaking done on the sketch, but it sure was fun to draw! I played around in Leo for a bit before going on to sketch the Siamese Twins in Virgo. I like interacting galaxy pairs and this was a nice one. Along the same lines, another interacting pair is the pair off of Charr in Canes Venetici, NGC 4485 and 4490. 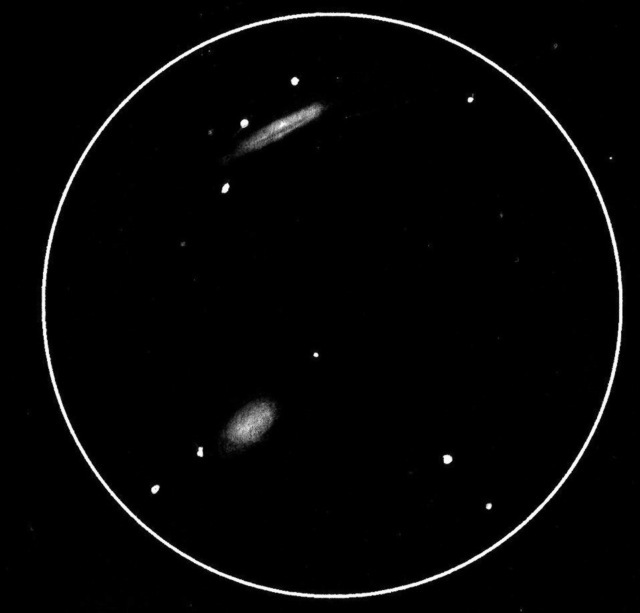 This group is a fairly large set of galaxies in my 18mm Ortho and a fine specimen to draw. I finished the night looking at the early summer sky enjoying old favorites like M27, M57, M17, M8, and M20. Dawn started to tinge the sky and it was time for bed. It was a great night. ~ by jhissong on 2010/04/16.